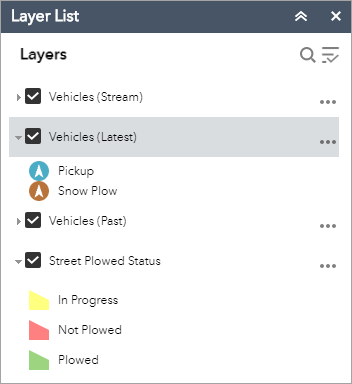 The Layer List widget provides a list of operational layers and their symbols, and allows you to turn individual layers on and off. Each layer in the list has a check box that allows you to control its visibility. Some layers contain sublayers or subtypes. The order in which layers appear in this widget corresponds to the layer order in the map. This widget provides functionality allowing you to change the order of layers in the map. Optionally click Change widget icon and replace the default icon with an image of your own. Optionally check the Show title check box to display the title label Layers on the widget panel. Optionally check the Show basemap check box to include basemap layers in the list. Optionally check the Show Legend check box. When this check box is checked, you can expand a layer to display its symbols. Optionally check the Expand all layers by default check box. This expands all group layers by default in your app, allowing them to be shown in the layers list. Uncheck layers in the map that you don't want to show on the list. Click the Layer List widget in your app to display the layer list or table of contents window. If the Show Legend option is checked, click an individual layer to show its symbols. Zoom To—Sets the map extent to the extent of the layer. Transparency—Sets the transparency for the layer. Enable Pop-up/Remove Pop-up—Enables or disables the pop-up for the feature layer. If a feature layer does not have a pop-up configured in the map, clicking Enable Pop-up shows all field values for the feature layer. Move up—Moves the layer one level up. This is for end users to reorder the layers in the app. The order of the layers is not persisted. Move down—Moves the layer one level down. Open attribute table—Opens the attribute table for the feature layer. Description/Show Item Details—Opens the service description or the item details page for the service or the item associated with the layer if available. Click the Control all layers button to control the behavior of the layers in the list. You can turn the layers on or off , and expand or collapse the layers. Alternatively, you can use keyboard shortcuts to do the same. Press Ctrl and check the layer check box to turn the layers on or off in the same level. Press Ctrl and click the arrow to expand or collapse layers in the same level. Click the search button to find layers. Layers in the list are unavailable when zoomed out of their visible ranges. Click the close button to close the Layer List window.